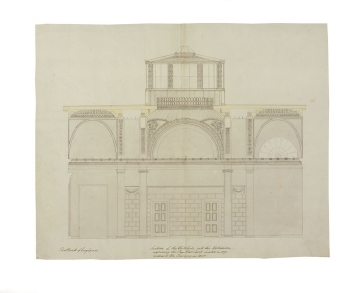 Drawing 6 shows a hall of three bays, with the middle bay top-lit by a lantern dome. The dome is supported by four semicircular arches, with the same number of Ionic columns supporting the corners. The spandrels of the arches are richly decorated with a cornucopia motif. The lantern is glazed as well as is top-lit in the center of its roof.